Scenes from the fifth Business Management Conference. 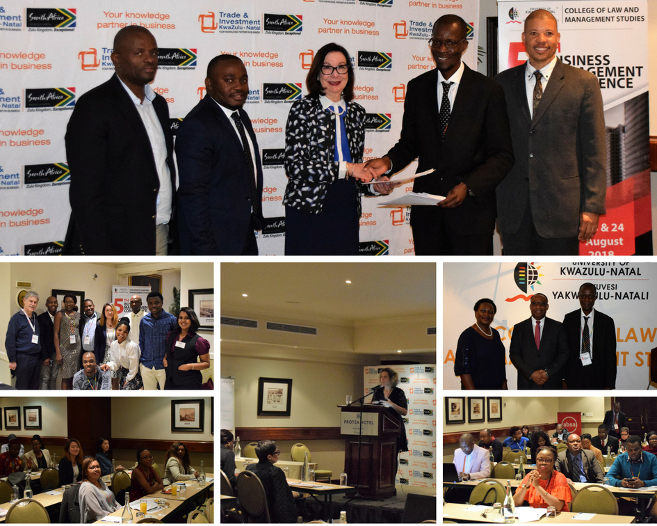 African Cities of the Future: Management and Legal Solutions was the theme of the fifth Business Management Conference (BMC) recently hosted by the College of Law and Management Studies at Protea Hotel Edward, Durban, from 23-24 August 2018. The two-day multidisciplinary conference was attended by national and international delegates and saw 98 research papers being presented by scholars. These papers addressed various topical issues including population congestion, infrastructure, food security, pollution, social disaggregation, unemployment, service delivery, crime, violence and lawlessness, child and women vulnerability, health, the environment, and proper urban planning and design. Key addresses were delivered by Deputy Governor of the South African Reserve Bank, Mr Daniel Mminele; General Manager for Business Retention and Expansion at Trade and Investment KwaZulu-Natal (TIKZN), Mr Donny Pethan; former eThekwini City Manager and co-founder of City Insight (Pty) Ltd, Dr Michael Sutcliffe; and Professor Marlen Arnold from Germany’s Chemnitz University of Technology, Faculty of Economics and Business Administration. Mminele focused on economic and policy challenges in Africa; Mr Pethan delivered a presentation on strategic partnership for economic development; Arnold spoke on Green Cities and the Circular Economy in the context of SDG 11, while Sutcliffe delivered an address titled: African Cities: Reimagining and Rethinking their Planning. The College’s Acting Dean of Research and Head of the conference organising committee, Professor Harold Ngalawa, said the conference plays a crucial role in driving engagements, knowledge enhancement and exploration of collaborative areas that experts, business practitioners and global citizens can contribute to with the aim of providing evidence based solutions to complex global challenges. ‘As UKZN, we are conscious to the fact that we are living in a rapidly evolving world which is expanding at an exponential rate. This calls for innovative interdisciplinary and multidisciplinary synergistic approaches when it comes to finding solutions to challenges that are unique to the African continent. Hence, the papers presented at this Conference address these challenges and are in line with the University of KwaZulu-Natal’s Strategic Plan (2017 – 2021),’ he said. The major highlight of the conference was the signing of an intent for a co-operation agreement between UKZN and TIKZN which will enable the exchange of knowledge, skills and resources in an effort to boost the KwaZulu-Natal economy. Chairperson of the TIKZN board, Ms Ina Cronje, said as a UKZN alumna, she is proud to have the Institution partnering with TIKZN. ‘It is always with great pride that I follow developments at UKZN because it is a formidable institution with a great reputation and valuable resources that we can tap into. May this relationship be to the benefit of the University as we know there is a demand for relevant research that can be applied in the practical world and to the benefit of the people of this province because as TIKZN, we exist to serve them,’ she said. TIKZN’s acting Chief Executive, Mr Neville Matjie added that enhancing and growing his organisation’s long standing relationship with UKZN is an important part of the vision to enhance TIKZN’s research capabilities and for the organisations to support each other in the development of packaged opportunities for investors and traders. Ngalawa said that although an MoU between TIKZN and UKZN exists, the new agreement will solidify it when it comes to UKZN producing research that is guided by the needs of society. ‘We take pride in being a research led university and our teaching and learning is guided by research, hence this association will allow us to produce research that the business sector needs and can practically apply,’ Ngalawa said. Besides enhancing knowledge and research, the conference also served as a platform to foster networks between the international community and universities as participants of the 12th American-African-European (AAE) Summer School were also part of the programme. The AAE summer school is an initiative of UKZN’s School of Management, Information Technology and Governance.